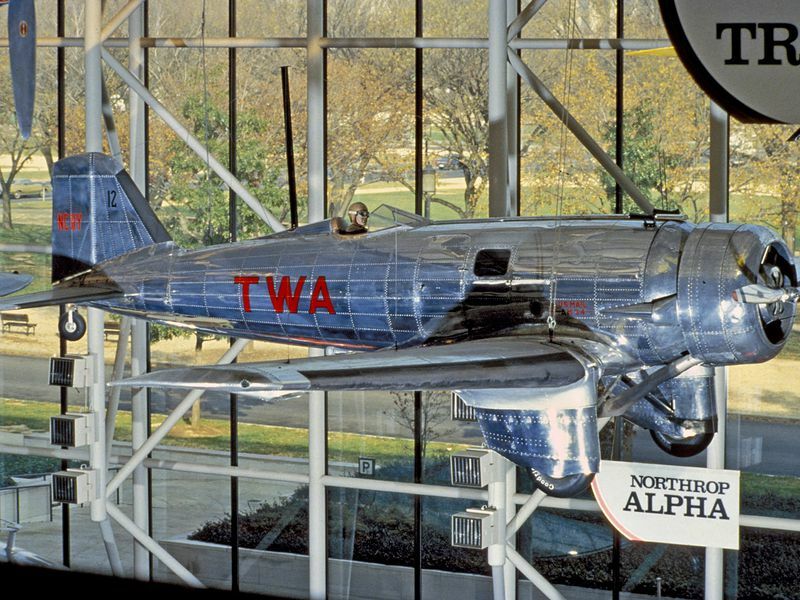 The National Air Space Museum transforms the way it tells the story of air travel. A Douglas DC-3, a Ford Tri-motor, and the nose of a Boeing 747 jumbo jet. 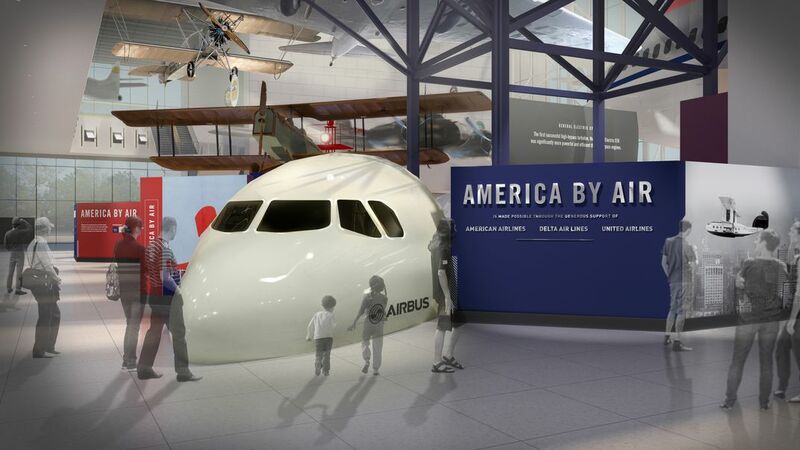 These icons of U.S. aviation history will continue to anchor “America by Air,” one of the most popular exhibits in the National Air and Space Museum’s building on the National Mall. How the airplanes are presented, interpreted, and placed into the narrative of commercial aviation history is about to change. With gifts totaling $28 million, nine major commercial airlines are supporting the transformation of the air-travel gallery, as the first step in a transformation of all of the Museum’s exhibitions and visitor experience. “America by Air” will close later this year to undergo its three-year renovation. In support of the “America by Air” gallery, American Airlines, The Delta Air Lines Foundation, and United Airlines contributed as lead donors with Alaska Airlines, JetBlue, Frontier Airlines, Hawaiian Airlines, and Spirit Airlines also supporting the effort to reimagine the gallery. In recognition of a gift from Southwest Airlines toward the transformation of other museum exhibitions last year, the Welcome Center in the Museum’s “Boeing Milestones of Flight Hall” has been designated the Southwest Airlines Welcome Center. “America by Air” curator Bob van der Linden spoke with Air & Space senior associate editor Diane Tedeschi about the gallery highlights and what visitors can expect after the renovation. Air & Space: What is your favorite artifact from “America by Air”? Bob van der Linden: Anybody who knows me knows that it would have to be the Boeing 247, because I wrote a book on it. I’m very fond of that airplane. It’s not that well-known an airplane, but it’s the world’s first modern airliner. It really transformed the aviation industry. Yeah, it would be that one. Another prized artifact is the Pan Am globe. We have the actual globe that was in Pan Am president Juan Trippe’s office. It’s the one in the classic photograph: Every time you see Juan Trippe holding a pipe, looking at the globe, and plotting his next international routes during the ’40s and the ’50s—we have that globe. I was in negotiation with the Pan Am Historical Society for quite a while to get that. And they very kindly did give it to us. I’m real happy with that one. I mean that is the symbol of Pan Am—one of the greatest airlines in history. And that was Trippe’s family globe, which dated to 1846. He literally would get a piece of string and put it over one destination to another destination and measure the distance and the routes and set about his world conquest with it. If you’ve seen the movie The Aviator, there’s a scene when Juan Trippe, i.e. Alec Baldwin, is looking at a globe—that is the globe. The Pan Am Historical Society lent it to the movie producers. What was the most challenging artifact to acquire? Remember most of the aircraft in that gallery were there since the building opened [in 1976]. I’d say, though it isn’t technically an artifact, the Boeing 747 nose took quite a lot [of effort]—because of its mass. Getting Northwest to agree to it took one letter from me—because they were looking to give us the whole airplane at a time when we were looking to find one. I wanted the nose of a 747 or some other very large airplane, and the seven-four is such a classic airliner. I wanted a typical contemporary airplane so people could go in and just see how much larger they are than the world’s largest airplanes from the ’30s. [Northwest Airlines] called me out of the blue, offering me the whole 747. And I said, ‘Well, I can’t take the whole airplane, but would you be amenable if we could take the nose off it?’ And they said yes—that was in 1999. They were wonderful—they took it out of service. Which of the exhibit’s model airplanes would be most sought after by people who collect them? We have a Benoist XIV [a flying boat biplane], which is beautiful. It’s the airplane that was used on the very first airline, which was from St. Petersburg to Tampa, Florida, in 1914. It’s a gorgeous, hand-built model. We also have a beautiful Curtiss Condor, which was a big biplane—a sleeper transport. This model was built in the ’30s or ’40s. It’s just gorgeous. One of the most interesting models we have is a United DC-7 cutaway that was built in the 1950s as a model for airline ticket agent’s offices. I remember as a child, in D.C., all the airlines had ticket offices on K Street. I loved walking by these ticket offices because they all had cutaway airliners in the window. They were so much fun to look at, and this is one of those. What artifact or object is most favored by visitors? Well, it’s human nature, but the two objects you can walk through—our visitors just love those. They’re real airplanes, but you can actually have an interaction with them. Museums have to protect their objects, but people really want to touch them. We understand that, because for some people, it’s not real unless you can touch it. But in this case, we have two airplane noses: the DC-7 nose and that 747 nose, which you can walk through. You can see the cockpit and the scale of the airplane. People relate to that. Every day you go down there, there’s a line to get into both those airplanes. Can you comment on the progression of air safety from the early days up to today? Well, today air travel is hands-down the safest form of transportation. Period. You know, it’s far more dangerous to get to the airport than it is to fly. Far more dangerous to walk across the street than it is to fly. Now, since day one of the airline industry— and when I talk about that I mean in the United States—practically speaking from around 1929, 1930, that’s when they really started to carry passengers, it wasn’t terribly safe back then. It wasn’t terribly dangerous, but there was a very steep learning curve. It was a brand-new technology. The airplane was new. The whole infrastructure was new—having to deal with weather and navigation. It’s been a very steady downward curve in terms of accidents and fatalities. And we’re now down to a wonderfully low point where we haven’t had a fatal accident for a long time. That’s because the government, industry—and not just the airlines, but the manufacturers—have all been obsessed with safety. Because they know it’s in no one’s interest for this form of transportation not to be as safe as humanly possible. There’s one thing we discovered when we were writing the script [for this exhibit]: Nowhere in the history of the airline industry do any airlines boast in their advertisements that they are safer than another airline. That’s because they understood very early on: If you question the safety of one airline, you’re basically questioning the safety of air travel. And it serves no one’s purpose to do that. But, yes, it’s incredibly safe today. And has been. Looking into the future of commercial aviation, what do you think will be the next big thing? Well, it’s a mature technology. You know, in 1958, the 707 comes out and enters service. It’s flying at about .8, .85 Mach. Today, a brand-new 787 or [Airbus] A350 flies .8, .85 Mach. It’s not speed; it’s efficiency. That’s what it’s been for quite a long time now. Because the difference between success and failure in an airline is just a few pennies per seat-mile. It’s a boom-and-bust industry, so they have to be very careful with their expenditures and very careful with their money. The safety is already there. But if you can get just a little more efficiency out of the aerodynamics or just a little bit more out of the engines, you can save millions of dollars in fuel costs. And that can make all the difference between the airlines prospering or going under. Is there a future for supersonic airliners? Well, there wasn’t a market for the supersonic airliner in the past. There are many laws you can break, but you can’t break the laws of physics. Because of the drag that arises as you go supersonically, no matter how much more efficient you might be able to make a supersonic airliner, you can make a subsonic airliner even more efficient. When you go supersonic, the drag peaks, and then it does come down once you get past supersonic, but the drag is still significantly higher than subsonic and transonic flight. Supersonic flight requires power; power requires fuel, and fuel is money. Supersonic aircraft cannot compete against a transonic aircraft, in terms of fuel consumption, and they never will—that’s physics. And as long as there’s a sonic boom, they’re not going to be allowed to fly over land. If you cannot fly over land, you’ve just—immediately—eliminated over half the world’s air routes. Now I know NASA is working on technology to reduce the sonic boom, and if you can get it down to a point where most people don’t notice or care, then that obstacle is eliminated. But you still have the problem of drag. Right now, there’s a big push for supersonic business jets and small jet airliners. Time will tell. If you can come up with a great SST, that’s wonderful. Then Airbus or Boeing will come out with a 797 or an A360 or -70 that’s 10 times more efficient. That’s what the airlines will want to fly. Because the airlines—and this is what a lot of people forget—they’re a business. Their job is to make money. If they can make money flying an SST, then they’ll do it. What is one of the most impressive technological advances reflected in the exhibit? Well, remember, this is a history exhibit, but one thing we do spend some time dealing with is the computer revolution. We have a lengthy discussion of fly-by-wire—as lengthy as you can get in a museum exhibit. We talk about the advantages of the digital fly-by-wire and the glass cockpit, and the newer advances in structures, in terms of composites. But the main thing is the computer revolution: It’s not just in flying the aircraft, but it’s in designing the aircraft. It’s in planning the routes, figuring out the ticket prices and all the algorithms that go into that. It’s completely transformed the industry: You can buy your ticket online. You don’t need a paper ticket anymore: You can put it on your smartphone. All of that makes travel so much easier from a consumer standpoint as well as from the airline’s standpoint and the manufacturer’s standpoint. Before the new exhibit opens, is there any artifact or object you’d like to acquire? Well, the sort of stuff I would acquire are airliners. And there’s no way a modern airliner is going to fit in this building. Other than a full-blown airliner, is there anything on your wish list? I’m always looking for airline uniforms. I’ve got a really good collection, but the exhibit has a whole section on racial segregation in the airline industry. I would love to get some uniforms from some of the early pioneers who broke the color barrier. But I don’t have them—I wish I did. What’s the best part about reworking an exhibit? We’re real excited to see the new stuff. We’ve been working hard with the designers and our people here to make the new show even better than what we have, and we’re very confident it will be. We look forward to the day it opens, and we hope our visitors love it.